Our back yard lacks shade. You would think a southern home would have a nice screened in porch or a deck, but we don’t. We do have a patio though where a grill once sat. We haven’t replaced the grill yet, but I did get a little help in the shade department from Brylane Home. 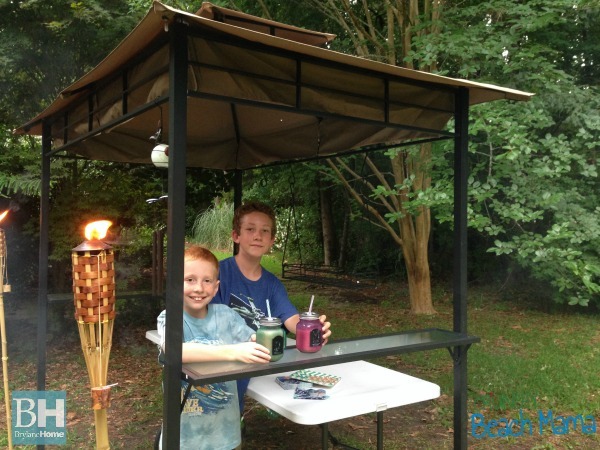 Introducing their Grilling Gazebo, that was made to house your grill, but it was a fabulous addition to our Smoothie and S’mores party the other night. 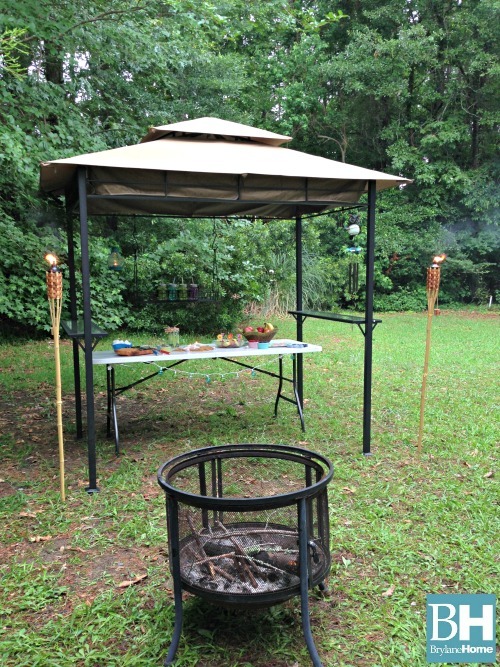 It covered my table perfectly and I could have brought the firepit inside too since the vented fire-retardant ceiling tent allows smoke to easily escape. It has two glass shelves and a handy basket and 5 hooks for grilling tools (or laterns!). A neat feature is that it is also rust-resistant. I think that is a must for any outdoor furniture, don’t you? That is not always the case though. The frame is steel and tough! I chuckle thinking back how Hubby told me he’d have it up in 20 minutes. An hour and twenty minutes later it was up – a little longer than expected, but he will admit that once it was up he was very happy with the construction of it. Good thing he had a 12-year old helper! We are going to keep the gazebo up. It’s not really the kind you can take up and down, though I know Brylane Home has other awesome pop-up gazebos that will. This cover IS easy to move though with two people…not too heavy to lift and change about in your yard. Everyone had fun the other night and commented on the great grilling gazebo. The shelves are definitely an added touch that makes it even more functional – not just for your grilling accessories like intended, but a place to set your drinks. ha! Check out Brylane Home for all your summer needs. Happy 25th Birthday Energizer Bunny Giveaway ~ 5 Winners! We grill out every weekend year round so this would be AWESOME to have! Yes we do grill out quite often. I know sometimes my hubby does get very hot standing in the sun grilling. This would be great to give him! I grill out sometimes, but I would love to use this for shade also. I think it would be great for relaxing outside in the summer. We grill out at least once a week in the summer months- this would be great! I love grilling! I think this would help it a lot easier when we do get togethers! We grill just about every weekend in the summer, and about once a month in the colder months. This would be great to have, especially if it starts raining! There's nothing worse than grilling in the rain! We grill at least once a week when the weather is nice. I don't grill much, but this would be great to shade me and my laptop when I'm outside letting my fur baby play! We grill out often during the summertime! This would definitely be used A LOT! We would use this for something else. It would come in handy! I love to grill and this would an awesome addition to my set up. WE love to grill, so this would be perfect! We grill every weekend during the summer months so this would really come in handy. I grill out almost every other day in the summer. We grill a ton in the summer. I would love to win this! We grill a lot in the summer time, and it would be so nice to have a Grilling Gazebo to keep the sun off of us. This sure is a really nice one. Thanks for the giveaway! My grill is under a covered porch and gets used ALL YEAR. I would be using the gazebo on the back patio that isn't covered to help keep the hot Florida sun off the kids when they are playing in their sand table and kidding pools. I grill quite a bit but I do not have a gazebo. We grill out almost daily and we do it all year long, nothing like grilled food! We grill out constantly - even in the winter! This would be awesome! This would be great to keep the hot son off your head while your grilling. We grill out most of the time during the spring and summer...especially on the weekends! I could think of a few things I could use the Gazebo for...it's very versatile! We love to grill out! I love to grill but haven't done much of it lately. Yes we do grill out a lot. This would be perfect! I would probably give this to my brother's family to put over their grill on their back deck! We grill out almost every night during the summer months. I know this gazebo would come in handy. I'd use it as a shady hangout spot when playing outside with the kids! This would be awesome for our family, we are always outside and grilling. It's apart of a weekly thing. We entertain a lot with family and friends. This would make a great addition to our grill and some of my flowers I could put on it. I Grill Out A lot In The Summer, This Would Be Perfect For Entertaining! Hubby would love this for his outdoor grilling man cave! We grill out every night, rain or shine so this would come in handy. Now he is using the garage for cover when it rains. I don't know how safe that is!!! yes we do grilling several times a week now ,when weather is so sunny.Love it! I would grill out more if I had great shading like this! WE love to cook steaks, etc. on the grill! Yes we love to grill , and it would be awesome to have a Gazebo to picnic under during awesome weather! Definitely would be using this for grilling. Yes of course we grill out alot, even sometimes in the winter. We also love grilling and bon-fires while camping as well. What a nice giveaway !! We do grill a good bit on our big green egg but I think I would use this for something else like you did. My husband does the grilling in our family and I wish he was available to do it more. I love the gazebo--thanks for the giveaway! We love to grill but I actually think this would be awesome for my dad. He grills so much during the summer and this would be perfect for him. Thanks for the chance! I grill more than I cook inside. It's my favorite way to prepare dinner. We'd use this for all kinds of things, but it would sure one in handy on the rainy and snowy grilling' days! We love to grill in the warmer months, so this would be great for us to use as a Grilling Gazebo. We grill a LOT during the summer months, and this would be a very nice addition to our patio. Thank you for such a great giveaway! We grill out pretty often. I think I'd use the gazebo for shade at parties. We do grill a fair bit int he summer. & I could totally see my son playing under this when it's not being used for grilling! Yes, we grill quite a bit....mostly only for family, not guests. summer, fall, spring, winter..no matter with us..we love to grill! Now that it isn't snowing, we will be! Hubby loves to cook meat and I like the smell outside! We grill all year round and this would be a great addition especially in the summer. Thanks for the great giveaway. This would be great for us for grilling There is no shade in our yard at all. We do grill out a lot. Food just tastes better grilled. Do grilling on most weekends during the summer. I love to grill steaks and chicken. We do not grill out yet as we are in an apartment still but we are going to start looking for a house in the fall and it will be perfect for a backyard! we love to grill. any chance we get! We grill out more than some, less than others, but we'd enjoy it a lot more with a grilling gazebo. Thanks for the chance. Love this...would probably use it for something other than the grill like you did! :) Thanks for the chance to win! Yes, we do grill out a lot. We live in Florida and the weather is just beautufl right now. We grill all 4 seasons here. I love to grill year around............turkey on the grill during the holidays is awesome. Summer time lots of great meats and veggies to grill. We grill out a lot but this would be perfect for the kid's play area! My sister just got this a few weeks ago and she loves it now i want one to use for shade since my patio is small and i can't fit a full size canopy on it. I would love to have this for grilling and camping and birthday parties. Gosh I could think of a ton more. I LOVE grilling out and we could totally use this in our backyard! I grill a lot this is perfect as when it rains I currently use and EzUp or just bbq in he rain. The EzUp doesn't work as well as this appears it would. This would be great for when we grill and have BBQs! Love it! i grill a lot, everything taste better to me when it's grilled. this would be a nice addition in the summer when it's so hot. Yes, we grill out a lot in the warm seasons, sometimes all the way into late November. In the summer months, the sun just beats down on the cook at the grill. It can be miserable. The Brylane Grilling Gazebo would be such a relief and a pleasure. We do grill a lot, but it would probably cover the table we eat at for the shade! This would be great for a dinner outside in the shade or for the kids to have a good shady spot to play outside this summer! I would love to win this for my husband. He loves to grill in any kind of weather and this would definitely help make it a little more enjoyable. I love to grill out in the summer. I'm planning to grill this weekend. Awesome idea for rainy minnesota! I do grill a lot in the summer, and I would also use cover so I can sit in the shade and read a great book. I sun burn easily so I have to be careful. I grill out at least two times each week. I love to grill pizza and veggie kabobs! I would love this gazebo! We don't grill out too often, but this look perfect for picnicking under! Would love this whenever I grill. We love to grill, nothing like a fun bbq on the weekends to get away from the kitchen and relax.....especially when my husband takes over the grill. We are always grilling out and having friends/family over. This would be perfect! I grill out at least 4 times a week in the Summer! Love this set up. It doesn't get any better than that!! Living in Florida we grill out all the time and in the direct sun! This would be perfect! We love to grill almost all year. This would also be great for when my sister get's married in our backyard this summer. We could use it to put all the food under. We love to grill. We would use this as a grill cover. The shelves would, also, be a plus. Living in California, we grill all the time. 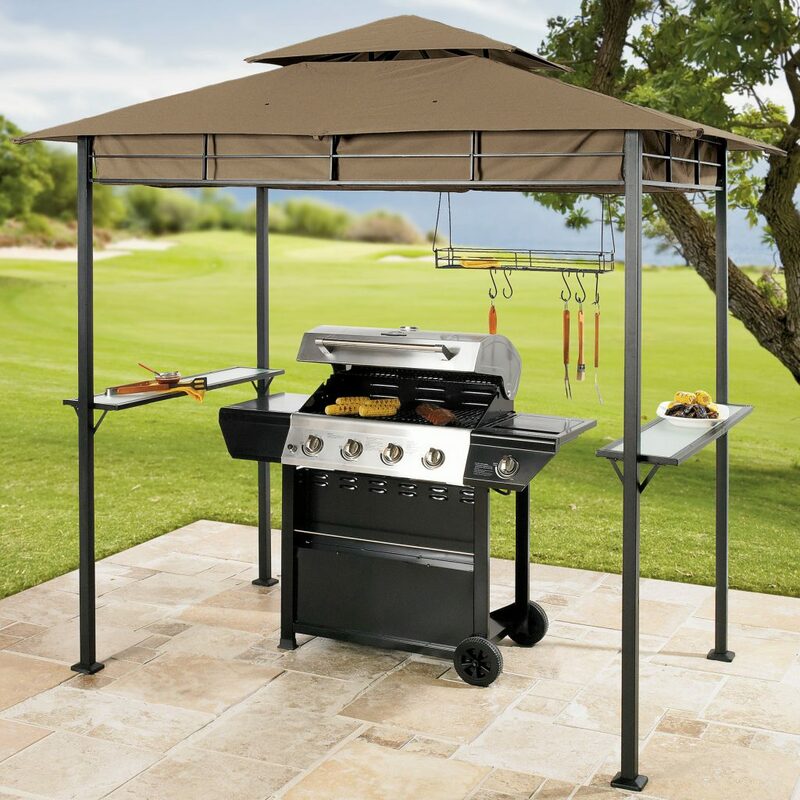 We love the grill, this gazebo would be perfect for it! We try to grill out at least 2 to 4 days a week. Food just tastes so much better on the grill! We grill all the time!!! Well, I would grill a lot more often if we had a nice spot for everything. Right now, it's grill right outside the Garage.. which is really gross and hot. *sigh* maybe someday.. we may have a deck. I grill out alot would be so nice to have in my back yard thank you for the chance to win one. yes, we love to grill!! i grill a lot during the summer! When it's nice out, we grill a few times a month. We grill just about every weekend. I would love to barbecue again!! i'd use it to grill out and also for hanging outside it would be a nice shady place. My hubby and I love to grill. We grill several times a week. We do grill out a lot and the gazebo would come in very handy. we grill all year long. I love the shelves on the side. I'd add a couple bar stools so I could sit the visit with the grill master. This is AWESOME! My hubby is a chef and we grill out ALOT! Summer vacation just started and we spend just about every waking hour outside! We live in the country so we have picnics, walk in the woods, have bonfires several times a week. This would be awesome to have! We don't have adequate shade either. I would love to have one of these!! Thanks to both of you for a chance!! Good Luck Everyone! We grill out 3 times per week on average never less than that but sometimes more! This would be a wonderful thing for us to have in our yard to keep on grilling even if its raining. Yeah we are die hard like that. Right now we use a beach umbrella. Hey it works! I'd use it for many purposes, but we do love to grill! We need a cover to grill cause it is too hot in Florida. We do grill out a lot. When I saw this in the catalog I could just imagine it in our backyard. I was thrilled to see it as a giveaway. I just got a new grill so I will be grilling a lot this summer. We grill in Ca every few days the weather is always so nice love this set up looks so wonderful to use. We grill out all of the time. This gazebo would be awesome! We do grill a lot and this would be great for when we have guests! We grill out almost every other day during the summers! It's just great to be outside with kids running around! We grill a lot in the summer time and this would be great! This is the first year that we are really grilling out. We bought a table and chairs as well as a gas grill. We do not have any shade on our back porch so having a gazebo would be great! We do grill out some, but we'd probably use this for other things, too. Thank you for the giveaway!! I think we would use it for grilling. I like to grill every time I get a chance. We do grill out, but I would probably use it more for camping shade than a grilling shade. I live in Alabama so we grill almost year round. I love to grill out usually as soon as spring hits im grilling out just about everyday. I just got a grill for my birthday and we use it a ton! We'd use it to keep the sun off our little one during the summer months. We grill out a lot! Even during the winter if possible! We also just re did our backyard and I have a box garden and have created a little stone path and planted new grass.... plus I am waiting on a new fire pit.... so this would be the perfect addition for us! i so want to WIN this!!! Thanks for sharing and good luck to all! We grill out a lot, and sit outside a lot over the summer, sure would be nice to have some of these Grilling Gazebos. We grill out a fair amount-this gazebo intrigues me! yes, i grill all summer long! I think i would use it for shade while i'm watching the kids in the pool! We grill out at least 3 days a week. This would also be really great for me because I fish every weekend and when I get home I sit outside to clean and filet the fish, but I have no shade to sit in and after being on the boat all day the last thing i wanna do is sit in the sun any longer. We would also use this a lot for our many family and friend gatherings. It would definitely be used almost every day! We do grill out a lot. This would be so perfect! I don't grill. But my son does. He enjoys grilling outdoors all summer. I grill a little. I would use this for grilling and family get togethers. We grill out all summer long!! We would definitely get plenty of use out of the Gazebo!! My husband and I love to grill! This would be an awesome addition to our treeless back yard. I grill out several days a week. This giveaway would really come in handy! I LOVE how creatively that you used yours! lol I live in an apartment where we can't have a grill(BOO! lol) so I'd gift this to my awesome brother who is a HUGE griller in his big yard at his house..His birthday is soon, so this would be awesome for him!! Thanks for the chance to win!! Joey J. We live to grill out but don't do so often enough. This would get us out there a little more. We grill out all year long! The gazebo would be great for those flash and dash showers! We grill out a lot so this prize would be great! We grill out about once a week. We grill out a lot. Could really use this. Love to grill outside, this would be great for a nice shade. I love to grill year round. It is so easy to put all the meats in marinade along with potatoes and veggies and just pull them out day by day and throw them on the grill for quick easy, non messy, dont heat up the house meals! We grill outside at least once a week. Right now, I need to pull the grill apart and give it a thorough cleaning since it won't get really hot. We love to grill! This would be perfect. We grill out almost every weekend in the summer. We love to grill. My husband would love to have this but he might have to fight for it if it shades my little girls pool. We love to grill! Thank you so much for the chance to win! We definitely grill out a lot. I love having family and friends over for some great food and great company. I think it was a great idea to put the tables underneath it, like you did above too. I just got my first grill so I have been grilling out nearly everyday! We grill out at least twice a week, usually more, during the summer. I like that this would create a clear perimeter for our little kids to stay clear of. we grill out all the time in the summer!!!! love this!! I would use it for when I do the kids' birthday parties, ect. We grill ALL the time! This would be awesome! My husband grills out a lot, and this would make it so nice for him. Would shield the strong sun, and shield him from the rain as well. My husband loves to grill! We could also use this canopy when we go camping. When we are grilling, I would set up my grill under it in case of rain, and other times, I'd use it for a shaded relaxing retreat. I grill, but also love to camp and be outdoors, even whilst raining! Love to grill! This would be perfect! We grill a few times a month. It is hot here in Texas so the Gazebo would really help!! Yes we grill out a lot and this would be so nice to have to shield against the strong sun. i would probably use this as a gazebo, or give it to my mom to use over her grill! We grill out all the time. This would be so awesome. We do grill out a lot and this would look great on my patio. I have no covering right now. We grill a couple of times a month, but would probably put it on our patio, with chairs under it. We grill out a lot during spring and summer this would be great for rainy days or to even shade from the bright sun! We have an area tucked in the woods that we sit. This would fit nicely there to be able to sit there even in the rain. I try to grill or have my husband grill out almost every night in the summer. I see no reason to get the house all hot. I make hubby grill more often when I'm too lazy to cook in a hot kitchen! For sure we would use it for grilling! It gets so hot outside this would be awesome! We use our grill a couple of times a week. This would be great to give more shade in our yard, so that we can have more people over. I grill out at least a couple of times a week.This would be so nice to get out of the sun on those hot summer days. It would be great to use to add an element of privacy in an otherwise mostly unused backyard. We grill year round here in rainy Seattle and could really use this!! We do! We just got a new one - and it could use some protecting - ha! I would love to have this to grill under, it would keep me out of the direct sun and I could still enjoy the outdoors. I think this would be great for our hammock area! We do grill out a lot and hubby is always reminding me with need to cover the grill so it doesn't fade it from constant sun lite. Thanks great giveaway. We grill out almost every night! I loved to grill. It is just my son and I and we have a fun time. It makes mealtime more of a family event. I would use it for grilling during the summer. Oh yes, we grill all the time! Even in the rain. Lol, well my husband does anyways. I sometimes hold the umbrella for him. ;-) Thank you for the opportunity! Have a great rest of your weekend! We grill out all year long, even when there's a load of snow on the ground!!! We love to grill out and our patio gets a lot of afternoon and evening sun. This would be fantastic. We grill all the time and this would be a perfect addition to our yard. We do grill out quite a bit but it's already under a shelter. I would use the gazebo for people to sit under in the shade. YES WE DO --WE HAVE A BAR ON THE RANCH AND NEED THIS FOR SURE..
we love to grill, I would use this for that. My fiancée and I just moved into a house on a half acre with no shade so i would love love love this!!! Well, we do grill, but our back yard is not really very attractive - or level. If I am lucky enough to win, we'll probably leave it at my mother-in-law's house - we tend to all gather there for grilling events. this would be so great for parties! my family loves to grill in the summer. 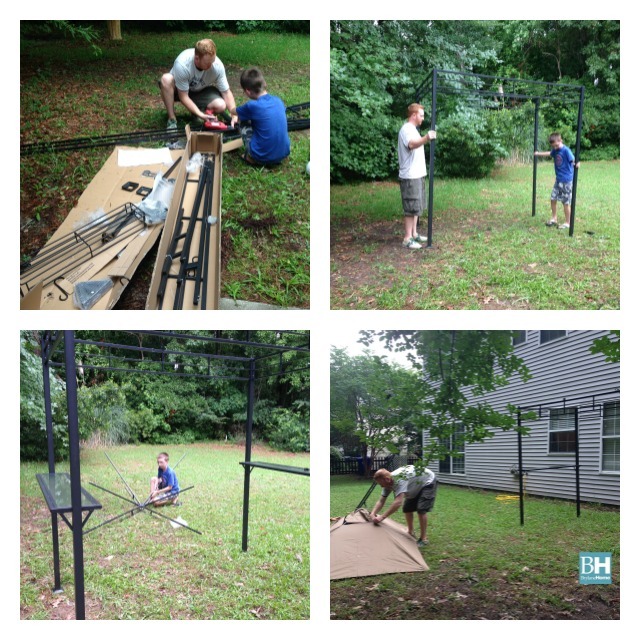 We do grill out a lot, and hubby's been wanting a gazebo of some sort for over the grill! We-Love to grill! This would look great on our patio! Thanks for chance this would be great for out family. We try to have a huge cookout yrly for family and friends and this would help so much. I would give this to my daughter in law to use for a seating area. yes we grill out a lot we love to grill. We grill a lot and would use this for the grill. we love to grill outside but it rains a LOT here so this would be FANTASTIC!!! We do grill a lot during the spring and summer! This would be perfect for really hot sunny days! Yes I grill all the time and I really love my new grill and would love to treat it right and cover it up! We grill out year round. I do grill quite a bit. This would be great to have for our outdoor parties. We LOVE to grill out and do it as much as possible! We grill out all of the time and my husband would love this. We grill out all the time and this is awesome. I love to grill! I have been working on my backyard to make it a perfect entertaining area, and this would be the perfect addition! I grill a lot and this would be perfect for our backyard!! This time of year we grill out more often than we cook in the kitchen. We have a lovely deck on the back of our house but it is not covered. This gazebo would be the perfect shady solution for that space. We do grill out a lot in the Summer and that is exactly what I would use this for! We do love to grill and ever since my Honey/Hubby's bout with skin cancer ~ we try to be extra careful. 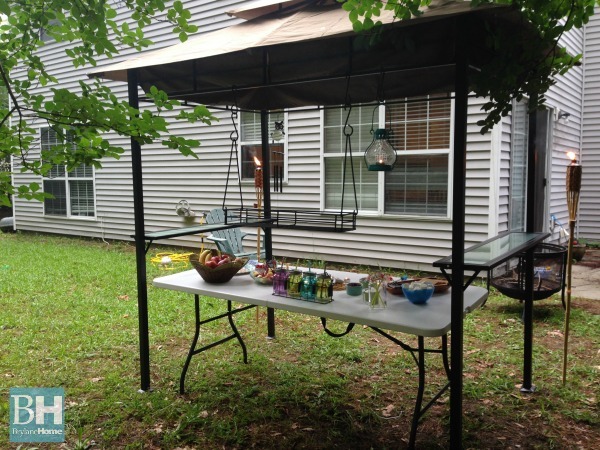 But this gazebo would also be so great for entertaining as either a bar or a buffet! I don't grill out as much as I'd like to because the house we live in now makes it difficult (layout, steps). We're moving in the next year and it will be much more convenient to do so then and I hope to do it a lot more. We grill every single weekend :) I would use this for shade in the off-time that we're not grilling. Love this!!! Definitely will use it w/ our grill. We grill outside all year round, even foot deep in snow. I love grilling, we do it all the time! Thanks for the awesome giveaway! I don't grill a lot but this would help a lot when I do grill. Our grills always rust because the covers blow off of them in the wind. I'd love to have one of these! I would use it for family reunions in case of rain. I'LL USE IT FOR GRILLING. We like to use them for shade in the hot sun. I lived in Europe as a nanny and they would grill several times a week. I miss that. Maybe this gazebo would help me to grill more. We'd use it for grilling at the lake. Grilling out to the max!!! We grill out at least 4 times a week in the summer. Love this! We grill all the time and I always feel bad that hubby is standing in the sun grilling. This would make his day! We do grill out a lot, my husband loves making hot wings!